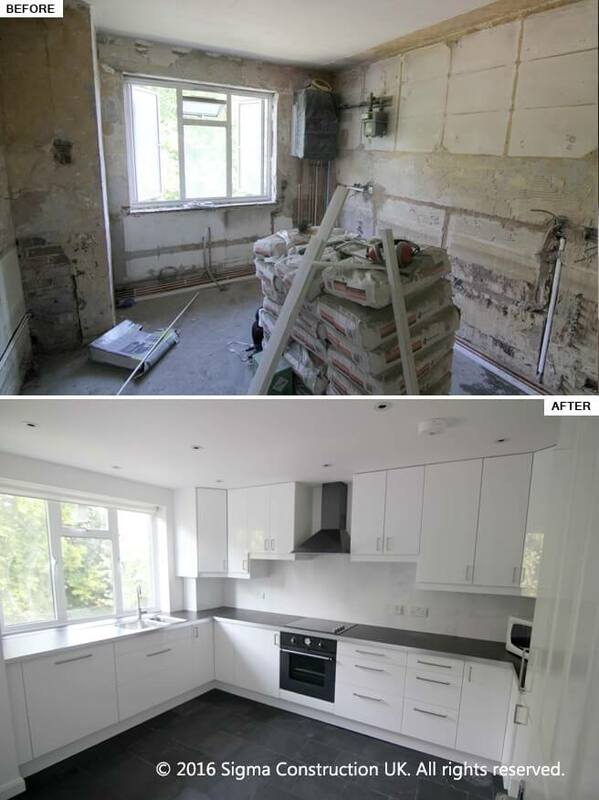 Sigma Construction UK carried out a complete flat refurbishmentof this run-down property situated in Maida Vale district of London W9. This UK property is located in a residential apartment block built in the 1960's. 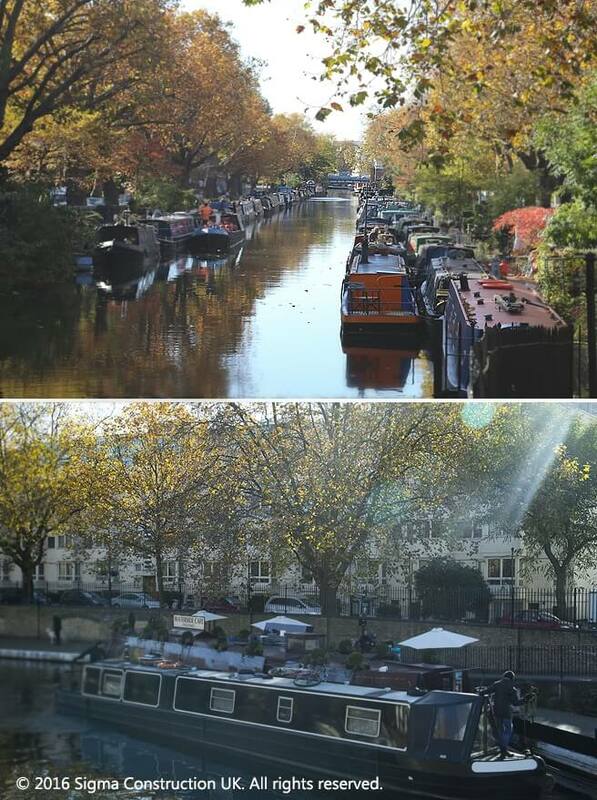 The block is positinoned in front of picturesquare canals of Little Venice, it's a short walk from Maida Vale and Paddington Stations. We delivered a functional, modern flat for a young couple to live in. 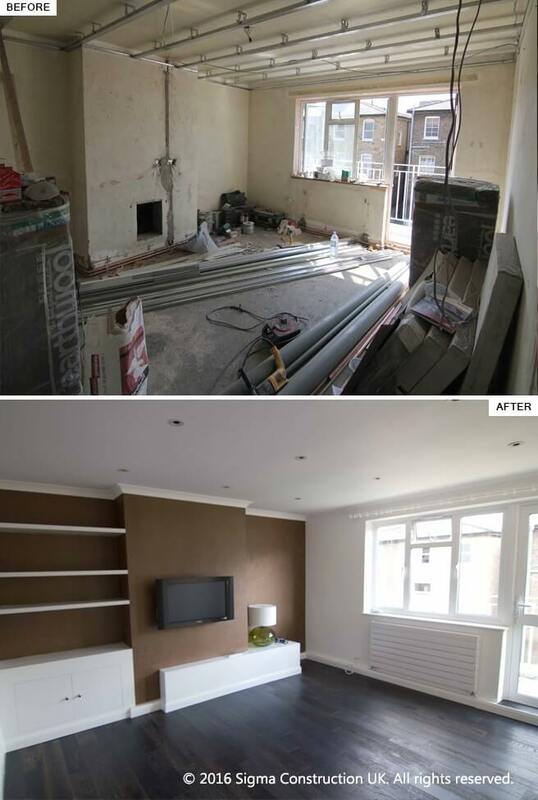 First, the flat was completely gutted in order for our builders to have a clean and open space to work with. To make the best use of the space in this flat refurbishment, the layout of the rooms was reconfigured to create a living area that is comfortable and enjoyable, whilst simultaneously maximising the space. Our builders made sure all the walls and ceilings were plastered and painted to the highest quality possible. All structural work completed in Maida Vale W9 was done under the supervision of a structural engineer, to ensure that all work was completed in accordance with building regulations, and that the appropriate materials were used by our builders to withstand the stresses and pressures imposed through environmental conditions and human use. 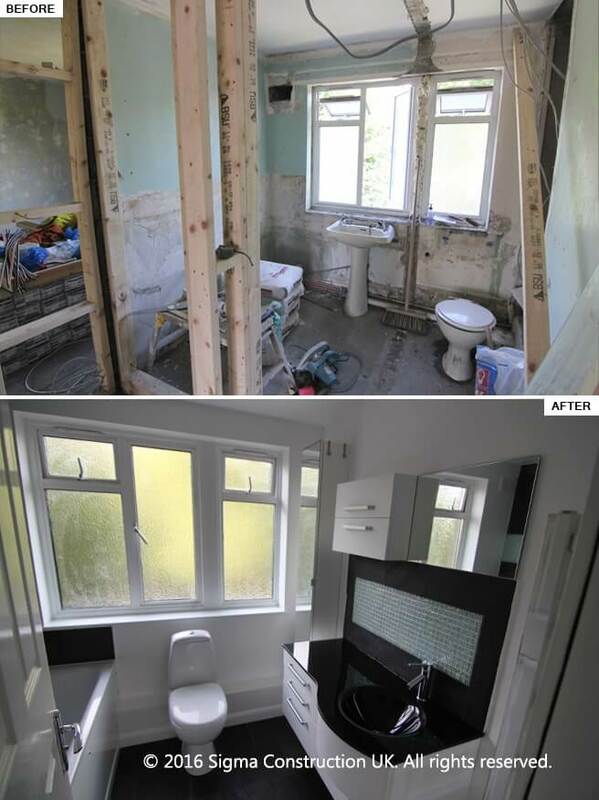 In order to enlarge both the bathroom and kitchen areas, our builders had knocked down any unnecessary partition walls which instantly created more space. We also added a new toilet. As part of the property refurbishment, Sigma Construction UK installed a new central heating system, which included an extremely energy-efficient combi-boiler. The next stage included completely re-wiring the flat: this particular client had opted for a hi-tech "smart home", which enabled them to control all the music, heating, lights and TV from an iPhone. As part of this modern flat refurbishment, our electricians also installed under-floor heating.  The bathroom was once again kept to a minimalist design: the black tiles and mosaic tiles contrast beautifully, which also works terrifically well as a splashback behind the sink. The bespoke basin, which extends from wall to wall, creates plenty of space and complements the dark floor tiles. We also placed additional mirrors, both for decorative purposes, and to add an element of sparkle to the bathroom. Our client had initially intended to paint the entire space in the living room white; however, further on in the project they decided to have a feature wall, which was created using one of the latest trends, a brown-leather wallpaper effect. This created a nice contrast between the white walls and the built-in units. As seen in the living room photo, we designed and constructed the built-in storage using shelving to make the best use of the chimney alcoves, a very effective use. The beautiful antique oak floor seen in the “after” photos was laid by our builders in the living room and the bedrooms, once again adding a contrast, with the oak’s dark finish providing a pleasingly contemporary look. The kitchen design within this London property refurbishment was kept simple, yet designed to be functional and practical. The area around the sink has been left clear, which offers our client plenty of space for food preparation; we had also left plenty of free space around the cooker for stowing cooking appliances, utensils, etc. In order to create extra space for spotlights, an ensure that the kitchen was well lit, our builders had suspended the ceilings. We had also placed additional downlights underneath the wall-mounted units, which not only adds supplementary lighting, but also creates a pretty, decorative effect, especially if the client wants to have mood lighting. All rooms were equipped with white horizontal radiators and hardwood panel, fire-rated doors, in compliance with current UK building regulations. The doors, though simple, add a classic look which fits comfortably with the rest of the interior. The doors were chosen by our client, but decorated and finished by Sigma’s builders. The white glossy wooden surfaces with a contrasting black stone give the kitchen a sleek and modern look that fits neatly with the rest of the flat’s design. And with a view to keeping the kitchen clean and sleek, modern kitchen appliances were concealed inside the base cabinets. If you are looking for a dedicated team of builders to carry out your London flat refurbishment, then please contact us!